Anyone have/had one of these? Any comments or advice? Seems like we had an association member that mounted some more off-road-oriented tires and rode the hound out of one of these. Maybe he put the more knobby tires on the standard CB500...I don't remember. If you do a search on this forum, I'll bet you will find something. Not sure which model it was but recall two of our Northeast Ohio members having Honda CB500s, Larry Ward and Nate Davis, pretty sure at least one is on the forum. Believe they had these bikes at Fall Color 2 (maybe 3 years ago, I know Nate has a new bike and Larry was riding and older BMW recently). A search in PDF versions of the past couple Blue Books may be another way to find them. Yep, confirmed both those guys had the bike, Nate Davis is shown as a 2013 model. Only 2 matches I found. Just curious what folks do for riding during the winter. Here in Tennessee we're almost exactly centered between Lake City, Florida and Cleveland, OH as examples of south and north. I know riders in the north have a tough time getting out for a ride while the folks in the south probably LOVE this time of year. In TN we have days that are a good excuse to have a, gulp, car, and other days that almost demand getting the scooter out. Today I had lunch 25 miles away with my sisters, and with temps near 40 and sunny skies, I HAD to ride. The low temps tomorrow and Monday nights are predicted to be in the single digits with possible snow on Tuesday...I'll likely be leaving the bikes alone in the garage. I've managed to squeeze in about 800 miles so far this month and will rack up a few more tomorrow before the cold front arrives. The 1st week of January was good for riding in southern Ohio/Northern Kentucky. But we’ve had several rounds of snow and cold since then. I put one bike in the basement and did overdue and needed maintenance. I’ve spent the last 3 days working on a local indoor motorcycle show. One Saturday with the MSTA breakfast. Next month is looking like it’s gojng to start out cold and snowy, but hope that by mid-Feb the weather might give us a break. We've had only a few really cold days down here in the deep south but also lots of rain. I have a tad over 1000 miles for January. Track day tomorrow will be in the 50s. What's this talk of riding in the winter? My bikes have been garaged since October and we have 6 inches of snow on the ground and getting 7 to 14 tomorrow. Temperature is nice though, it's +3 now and only going down to -10 tonight. I'm going to need different tires if I try to ride now. You live in "southern" Wisconsin don't you? Ron, I feel your pain. I live in southern Michigan and bikes are also garaged for months now. Only about 5 inches on the ground but prediction is for 3-7 by end of day, then -40F with wind chill on Wednesday. Brrrrrrrr. Well... I'm not sure about the thread diversion from talking about TrophyRider's new bike...(NICE!, by the way.) ...but since Geoffrey is a respected member and he diverted it.....then hopefully I can chime in unscathed? Just curious what folks do for riding during the winter. 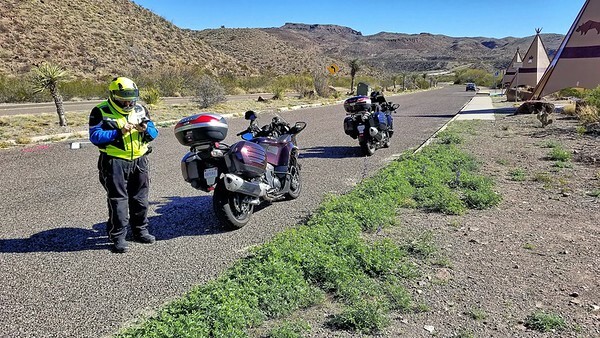 Some of us in Texas get together every January for the BBFO (Big Bend Freeze Out) ride. This was only my 5th year, but it's been going on now for over 25+ years. It is not affiliated with any organization or bike model but just friends and acquaintances from different groups and/or no groups at all. The weather was beautiful this year. Along the river road (TX HWY FM170) the Big Bend Bluebonnets were starting to bloom. We only had 7 attendees this year, 2 Hondas, 3 Kawasakis, one Yamaha, and a BMW. I don't know..."Did a thing today" was pretty specific as to the original topic, but it also seemed a little open ended. If I stepped on anyone's toes, I apologize. FartyMarty...Looks like you had a good ride there in BB. Today I had a gig at a local theatre to set up for a Christian rock band. At a balmy 28 degrees when leaving, I decided to ride the 'wing with its HOUSE of a fairing. This afternoon, it had warmed up to around 50, so I went out for a 50ish mile ride on the 1980 Suzuki GS450e. Tonight, when I go back for the concert load out, I'll ride the '86 VFR700. It'll be getting chilly by the time I get home, but I'll be headed home...and that makes a big difference to my mindset. Those were the last of fleet that needed to be ridden a second time during the month of January. Don't think there's any harm in your topic in this thread, not like you derailed an lengthy discussion. As for riding in the winter, nope not here. Too much salt on the roads, and the best nearby riding involves roads on the edge of a large valley and extremely dangerous conditions with debris and pot holes. Bikes get prepped for winter, and once they salt roads I'm waiting until spring. The lack of daylight and full week of work limit chances even if the roads weren't a mess. I don't own one but had a ni e 250 mile ride on someone else's. I really liked it's balance of size and all-around abilities. I've not heard of any significant problems from that owner. It benefits from some of the same types of add-ons and upgrades as the baby V-Strom, such as luggage-wind protection-gps-power outlets and so on, but stick works just fine. I really wanted some aux lights when it got dark. It does run out of breath in the top end but in normal riding it has great all around torque and power. It has the feel of a ride which will take you miles and miles with no fuss. I'd call it a great middle weight tour-adventure pick.